Stay at the Blue Heron Beach Resort between Now and December 20, 2019 and book directly with the hotel to receive unlimited FREE Mini Golf at the Hawaiian Rumble mini golf courses located directly in front of the hotel. Available for all paid occupants in the suite. Stay at the Blue Heron Beach Resort between January 2, 2019 and December 20, 2019 and book directly with the hotel to receive unlimited FREE Mini Golf at the Hawaiian Rumble mini golf courses located directly in front of the hotel. Available for all paid occupants in the suite. Valid for all direct bookings through our website. Book Now or through our reservations department: 407-387-2200. Less than a mile away from the Lake Buena entrance to Disney World sits the Blue Heron Beach Resort. A lakefront property, the hotel offers one- and two- bedroom condominiums designed for families visiting Orlando. Whether you’re here to snap a photo wearing mouse ears, find some shopping treasures, indulge in a round of golf or take advantage of the dining and nightlife steps from the hotel, Blue Heron Beach Resort is the perfect spot for your Orlando adventure. Enjoy a sunrise from your balcony or "ooh" and "aah" at the Disney fireworks lighting up the night sky. Take a jet ski or kayak for a spin on the lake. Get your heart pumping in our fitness center or prepare picnics to take to Disney, SeaWorld or Universal Studios. Whether you’re here to visit the theme parks, explore Orlando or take advantage of the amenities at our resort, Blue Heron is comfortable enough to feel like home. 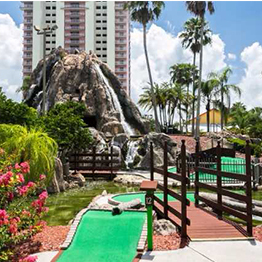 Ulimited FREE Mini Golf at the Hawaiian Rumble mini golf courses located directly in front of the hotel. Available for all paid occupants in the suite. Click below to book this fabulous getaway while suites are available. Valid for all direct bookings through our website: www.blueheronresort.com or through our reservations department: 407-387-2200. Effective with all new reservations arriving after May 1, 2017.The nightly rates paid at the Blue Heron Beach Resort are far lower than the rates you would pay at a traditional hotel while at the same time you will find much more spacious accommodations, two full baths, W/D, fully equipped kitchen, sleeping arrangements up to 8 and a balcony overlooking lake Bryant. We control our highly competitive rates by isolating certain costly services. Our nightly rates do not include daily housekeeping, instead we offer them on an Ala Carte. Not only does this save you money, but it provides greater flexibility, security for your suite and more privacy for you and your family. Also, we charge a one-time housekeeping clean fee of $45, payable upon arrival, which covers the cost of cleaning your suite after your departure. Effective June 30th, 2016 our Resort Fee is $15.00 plus a $3.00 Nightly Reservation Transaction Fee. Effective June 2, 2016 for all future reservations ( excluding Christmas week) we will require an advance deposit of $125.00 before confirming your reservation. This deposit will be refunded if you cancel your reservation 72 hours prior to your scheduled arrival. The HOA will close the pool Between January 8th and the 13th to resurface the pool. The other pool will remain open. Florida Resident’s Rates: You will receive a 12.5% discount off the best available rate For those booking the Florida Resident’s rate, please keep in mind you will be required to show your Florida driver’s license at check in. If you are unable to produce this I.D., you will be charged the current “prevailing rate” and required to pay for at least one night should you decide to cancel your reservation and seek accommodations elsewhere. 12.5% discount for Georgia Residents on our one-bedroom and two-bedroom condominium suites. Located just two miles from the new Disney Springs (formerly Downtown Disney). AAA Rates: You will receive a 12.5% discount off the best available rate For those booking the AAA member rate, please keep in mind you will be required to show your AAA membership card at check in. If you are unable to produce this card, you will be charged the current “prevailing rate” and required to pay for at least one night should you decide to cancel your reservation and seek accommodations elsewhere. Diners love to stop by Landry’s! They rave about the perfectly prepared drinks at the bar, the generous portions of delicately seasoned seafood, and even the steaks. In fact, most things on the enormous menu win praise. For creative takes on seafood and more, Landry’s is your place. When you’re in the mood for a nice steak dinner but you don’t want to break the bank, mosey on over to Lonestar Steakhouse. They offer an impressive menu of consistently good steaks and generous sides, but can also serve top-notch burgers, pork chops and chicken. The salads win rave reviews, too! Just across from the Buena Vista entrance of Disney World you’ll find this delightful attraction, which offers more than 20 restaurants and shops. Travelers love stopping by here for an affordable bite to eat before taking on a day of Disney! No matter your appetite or budget, you’ll find just what you’re looking for at Crossroads. Celebrating a special occasion? Johnny’s Hideaway is just the place you want to be. The menu highlights steak, seafood and raw bar items, and stone crab is available year round. The warm mahogany floors and the whimsical folk art paintings give Johnny’s an atmosphere of comfort and fun. If great deals make you jump with joy, prepare to start jumping. The Orlando Vineland Premium Outlets offer top-notch merchandise at outlet prices. Shop 160 stores, such as Ann Taylor, Armani, Barneys New York, Burberry, Coach, Nike, Tommy Hilfiger and Tory Burch for designer duds at prices that will make you smile. And jump! Shoppers love how easy it is to park and navigate this outlet mall. You’ll find the name brands you’re looking for as well as some more unique spots, but all offer incredible bargains. Shoppers also comment on the “coffee shop with character” and the Blue Bell ice cream that caps many long shopping trips. Recently graced with the title of “best restaurant” in Orlando, Raglan Road is a family-run restaurant committed to using the freshest ingredients in the most creative ways. Locals tell us that this delicious “new Irish” cuisine is best washed down with a pint of icy cold beer. This unpretentious steakhouse is a carnivore’s dream: from the rib eye to the filets, everything is prepared as requested and the generous portions ensure no one leaves hungry. Upon arrival you’ll be served irresistible homemade chips, but save room for dinner and dessert! If you’re looking for a casual, laid-back eatery serving Caribbean food and tropical drinks, Bahama Breeze is a quick drive from the hotel. Fresh (even wild-caught) seafood can be found on the extensive menu. Be sure to ask for outdoor seating; the warm breezes and live music will transport you to the Bahamas. "super location, close to all parks"
"Huge, comfy well equipped great location"
"As Tony,the tiger says, great!"